Sunday was the 100th anniversary of the end of World War I, in which so many men and women lost their lives. In the United States, we honor (remember with respect) this day as “Veteran’s Day.” A veteran is a person who has been part of a country’s military. I don’t think any of my close relatives were part of World War I. But my father, Patrick McQuillan, did serve in (was a member of) the U.S. Army during World War II, fighting in North Africa, Italy, France, and Germany from 1942 to 1945. He was just 19 years old when he was sent off to Europe to fight. As was true for many soldiers (members of the military), World War II was one of the most important events in my father’s life. He would often talk about it, and more importantly, he wrote about it in his memoirs (a history of your life; autobiography). I thought I’d share with you a short part of his (unpublished) book, Seven Come Eleven, a part that I myself only discovered yesterday. In this passage (part of the text), he describes how he and his buddy (friend) were part of the liberation (freeing) of a small town in southern France, and how they met with two American women there. We made it to Meyrargues [France], a nice little hamlet (small town) on the Durance River. It was a picture-postcard (very beautiful) town twenty miles from the beach. This is where I met a world-famous person and did not even know why she was famous. This lady and her companion (someone with you) came out of this little house as we had stopped near this town. We were the first American troops they had seen, and they wished to welcome us with champagne. 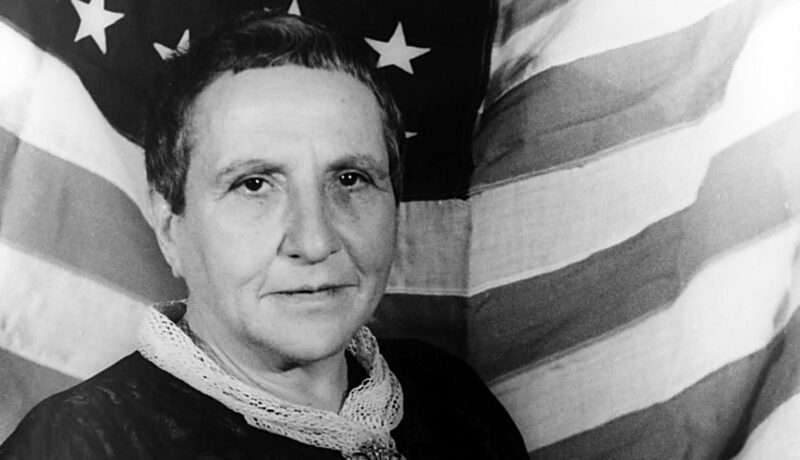 The one elderly lady was Gertrude Stein, an American. The other lady was Alice Toklas, her companion. They had been in France for many years and refused to leave because of the Germans. After we drank the champagne and left, John Polski [another solder] said, ‘Don’t you I know who they are?’ I said I did not, showing my ignorance. He told us they were famous writers and famous lovers. Gertrude Stein herself wrote her memoirs of this period soon after the war (The Wars I Have Seen). But her account (telling) does not match that of my father, who wrote about it long after the events took place. So what really did happen? According to Stein, she and Toklas were living farther north in August of 1944, near the French city of Belley. And they met their first American troops on the first of September, not in late August. But my father’s unit (group of soldiers) also went through that area the following week, so it is still possible that the meeting took place, but that he was confused about the location and the exact date. It is also possible that Stein, writing in her 70s and possibly ill with cancer, remembered it wrong. Certainly the event would have been more memorable (difficult to forget) for my father than for Stein. The important part of my story, of course, is not whether he met a famous writer or not. He fought for his country, and for the liberation of Europe. For this I honor him, and all those who bravely (with courage) served their country. This entry was posted in Books and Reading, News and Current Events, Uncategorized. Bookmark the permalink.